Combitube is a two way tube, having lumen on both ends. It is specially designed to use in emergency conditions and difficult airways. It is also known as esophageal tracheal airway or esophageal tracheal double lumen airway. It is a blind tube which do not require visualization to enter it inside the esophagus. It is commonly used in emergency conditions to make the airway open in patients with respiratory distress. This tube provide mechanical ventilation to the patient. This tube is inserted through the mouth to the esophagus. The one side i.e. distal side enters and the other side i.e. proximal side is kept outside. Used during failed or difficult intubation. In a patient with lack of ALS (artificial lung supply) in order to supply intubation. The patient with respiratory problems like respiratory arrest or respiratory distress. Indicated in patients having height above 5 feet. It is contraindicated inpatient with height less than 5 feet. Age is also considered, i.e. patient with age less than 14 years old cannot use this tube. In patients with already known esophageal disease can also do not use this tube. Patient with active reflex of gastrointestinal tract. It should be removed when the patients get recovered from the condition of faint. If there are burns, this tube cannot be used. The Combitube have two sides with lumen, one is the distal tube and the other one is proximal tube. The distal tube is inserted inside the esophagus through mouth and the proximal tube is kept outside. The cuff is at the proximal tube side which is inflated and pushed to provide ventilation to the patient. The proximal tube is at the level of larynx. The cuff is inflamed to protect the esophagus from aspiring the gastric contents. It is similar to the laryngeal mask. There are two sizes available of Combitube according to the height of patient. Combitube is different from the king airway in some aspects. Both the tubes are blind tubes. 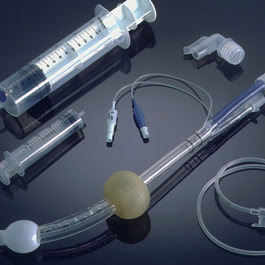 King airway is a airway management device and is used as an alternative to the other techniques like mask ventilation, laryngeal mask airway and tracheal intubation. The king airway is inserted into the oropharynx to the hypo pharynx and the Combitube is inserted in the esophagus. The king airway is used in patients with cardiopulmonary resuscitation and the Combitube is used in patients with respiratory distress. Both of the tubes are used to provide the mechanical ventilation to the patient.